Darioush is located towards the Southern end of Silverado Trail. We visited the winery on the occasion of California Girl’s birthday. The approach is down an almost daunting pillar lined driveway, that gives no hint at the warm hospitality with which we were greeted. We started our visit with a tasting in the gardens. It was a hot day, but the table was shaded and surrounded by a wide array of flora; a serene setting in which to savour the wines. We started with the 2016 Viognier. 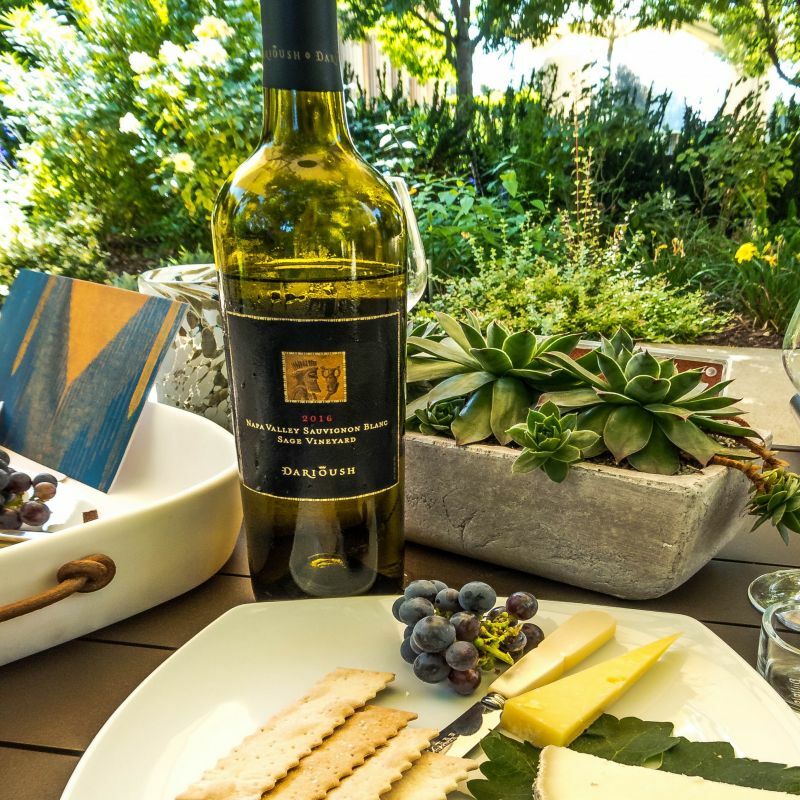 The grapes for this wine come from the Oak Knoll region. The colour was a pale straw hue, with a bouquet of citrus and honeysuckle. The dry wine showed a balanced palate of lemon, stone fruit, and minerals; resulting in a delightfully easy to drink wine. Whilst we enjoyed the wine on this summer morn, our host, Alessandra, took us through the story of the winery. Darioush Khaledi immigrated from Iran and created a successful chain of grocery stores in Southern California. 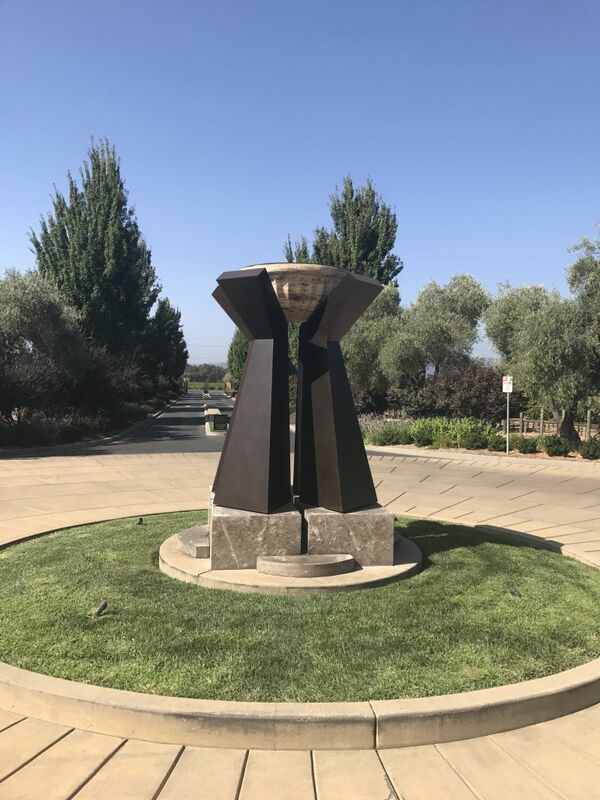 He had a lifelong fascination with wine, inspired at least in part by his father’s own winemaking in the Iranian city of Shiraz; known variously as the City of poets, City of gardens, City of flowers and nightingales, and City of wine. 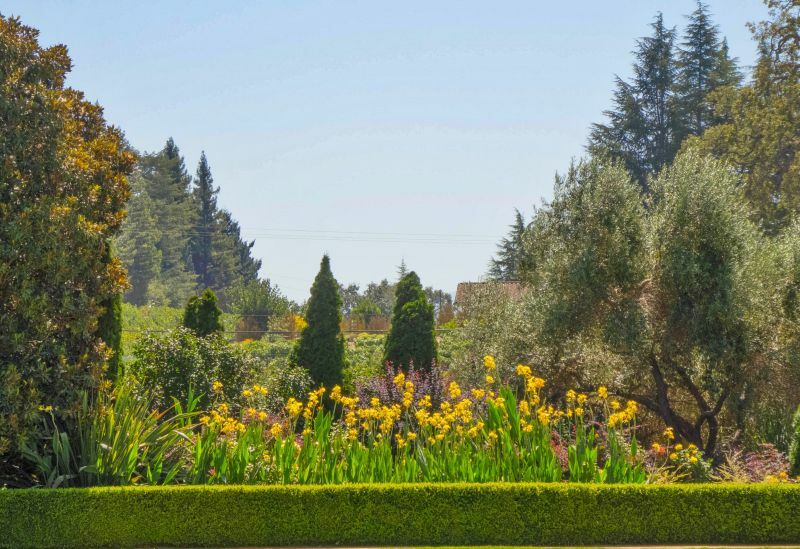 Darioush founded the winery in 1997, with the current site opening in 2004. Since day one Steve Devitt has been the head winemaker; an impressive example of continuity. California Girl Comments: Being a sucker for a great American success story, I couldn’t help but fall in love with this one. Darioush Khaledi has been awarded the Ellis Island Medal of Honor which is an American award founded by the National Ethnic Coalition of Organizations (NECO) which is presented annually to American citizens who have distinguished themselves within their own ethnic groups while exemplifying the values of the American way of life. How awesome is that! There are thirty-three acres of vines on the site on which the winery sits. 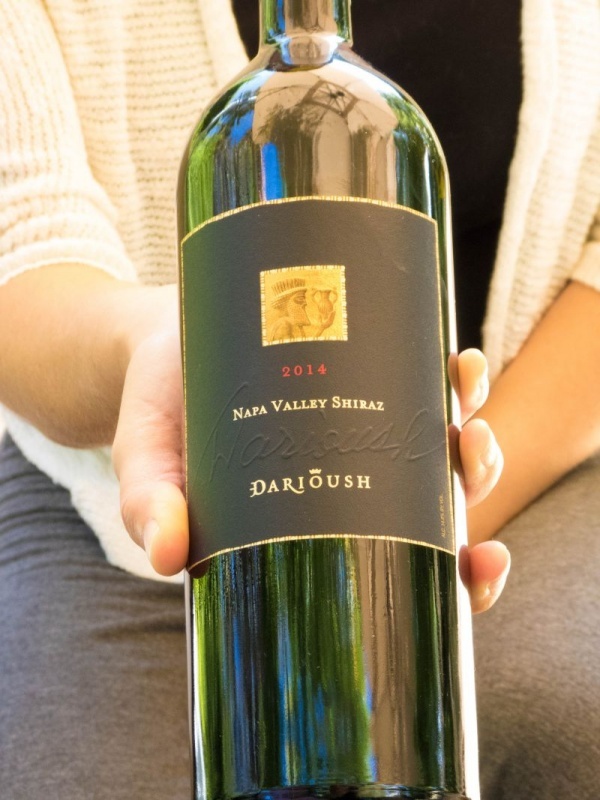 Darioush has two other estate vineyards; Ashley vineyard in the Oak Knoll district and Sage which is twenty-two acres on Mount Veeder, sitting between 1800 and 2200 feet above sea-level. 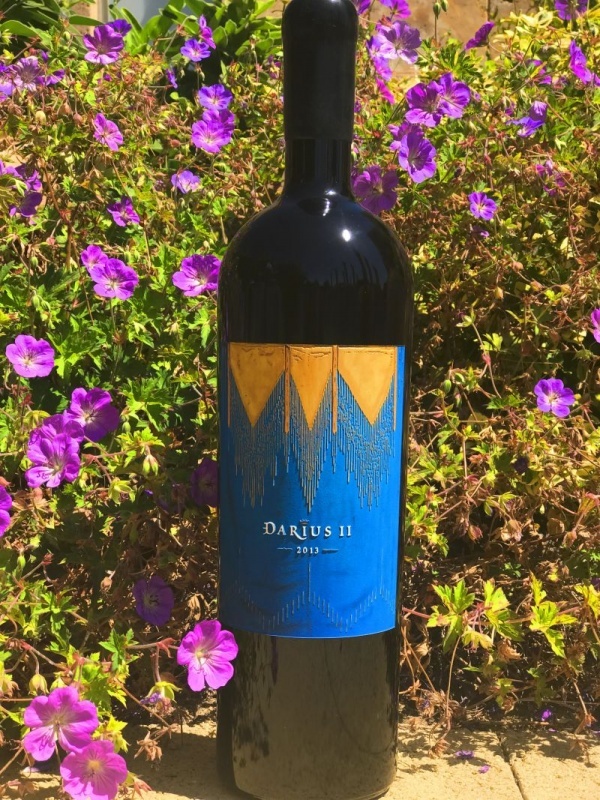 Given the city from which Darioush hails, it is perhaps no surprise that the winery makes a Syrah and uses the Australian name of Shiraz for the wine. We tasted the 2014 vintage ($78), which presented a lush medium intensity bouquet of plum with a swirl of floral notes behind the fruit. Taking a sip, I encountered a wine with medium plus acidity, initially dry, but with a long finish that left a delightful lingering sweetness in the mouth. The flavours were of plum, blackberry, and a mix of spice that included a tang of salt. This is an extremely approachable wine and in no way reminiscent of some of the indifferent Australian reds that I associate with the name Shiraz. 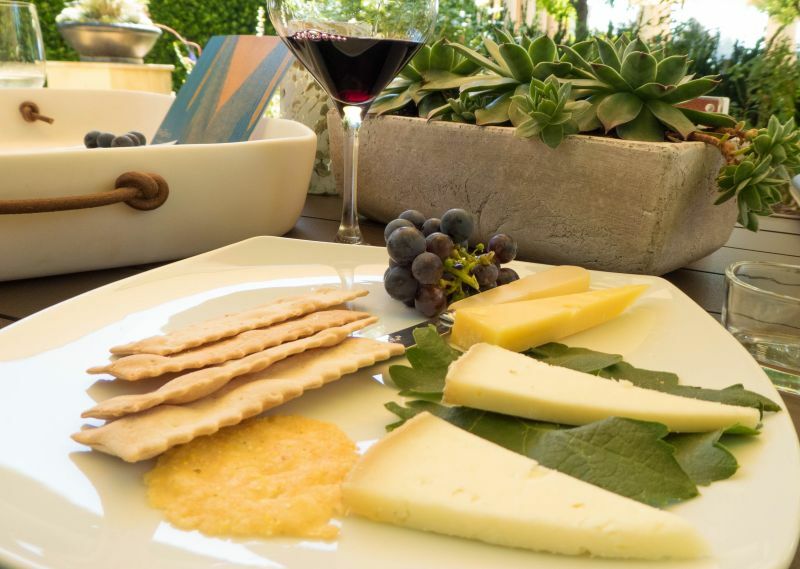 The wines were accompanied by a plate of cheese. These included a goats cheese called San Andreas from Sonoma; the name reflecting the farm’s location on the famous fault. Along with the cheese were crisps made of cornmeal and parmesan; providing a textural complement to the softness of the cheese. California Girl Comments: The tasting is so peaceful under the trees and surrounded by the garden space. For me, it enhanced the enjoyment of the wines. Just another reason to visit this amazing property. The next wine we sampled was the 2013 Signature Cabernet Sauvignon ($97.00). 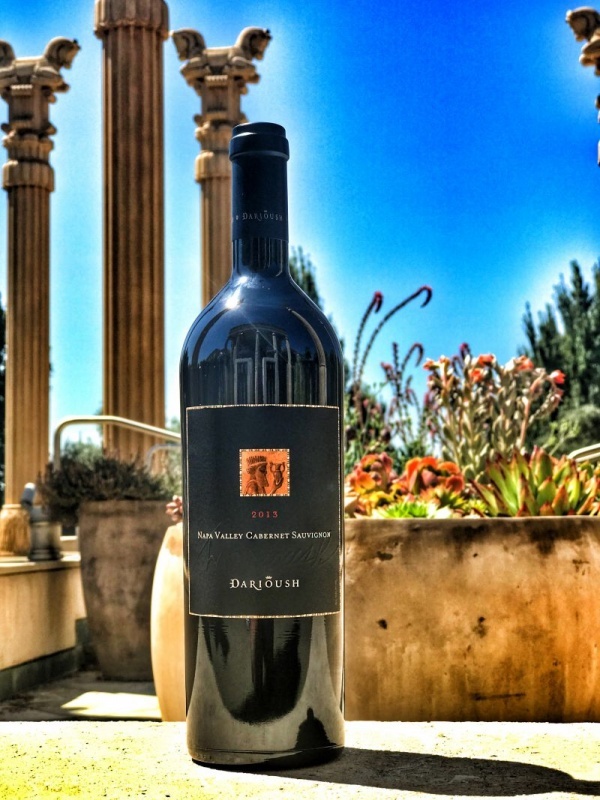 The grapes for this Cab coming from Oak Knoll and Mount Veeder; the result of harvesting from vineyards at the cooler end of the Napa Valley temperature range resulting in a more delicate, less assertive wine than a typical Napa Cab. From the deep purple liquid arose an intense bouquet of blackberry, sage, bail, and loam. The wine showed a balance of acidity, body, and tannins; flavours of plum, salt, and a rich earthiness lingered in a long and pleasing finish. California Girl Comments: This was my favorite sip of the day. It was so pleasant in the mouth. So earthy and lush. 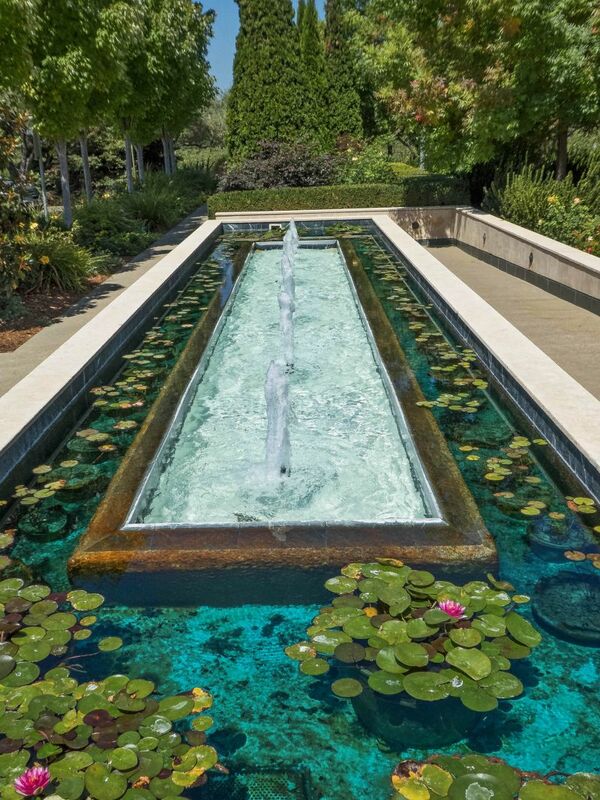 I wanted to just savor each flavor as I sipped, lazing about in the garden…. The last wine we sampled is the flagship for Darioush; Darius II ($245). Each vintage has a different piece of artwork featured on the label. 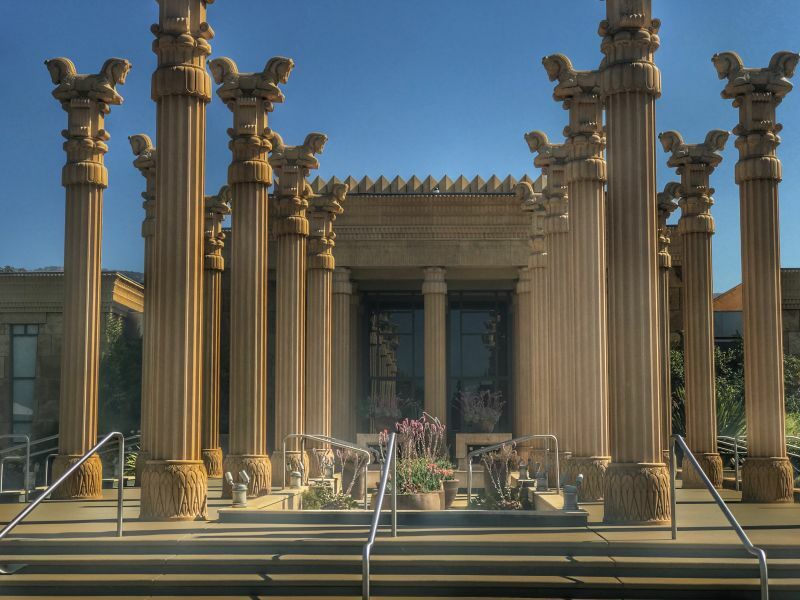 The winery has an agreement with the Victoria & Albert Museum in London and features items from its Persian Art collection. The 2013 vintage which we tasted used a late nineteenth-century cloak made from metallic thread. The original was donated to the museum by the Shah of Iran in 1877. The nose was intense, with aromas of cherry, earth, and leather. The initial impact of intense tannins and earthiness was softened by a mid-palate of plum, dark chocolate, and raspberry, all of which led to a long finish in which the fruit emerged to its full potential. This a wine that would benefit from time in a cellar and may improve for a long time to come. The wine is 90% Cabernet Sauvignon, 6% Malbec, 4% Merlot, aged for twenty months in 100% new French oak barrels. The Darius II is available only to members. We sipped this delightful wine as Alessandra showed us around the winery. 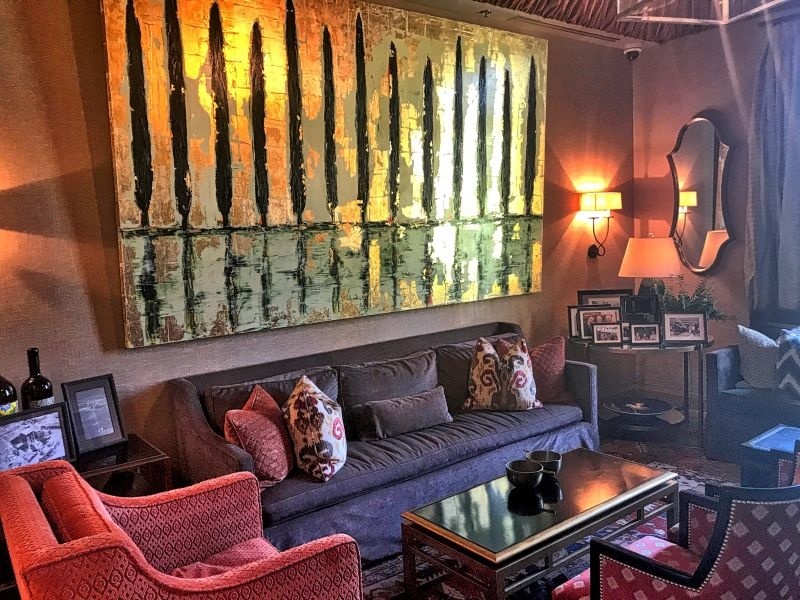 The main tasting room features stunning art but also allows customers to sit in relative seclusion; reflecting the intimate tasting experience we had enjoyed in the garden. To one side of this area is a room for members; which is furnished like a luxurious sitting room, even down to such details as framed family photographs. The ceiling was covered in vibrant draped silk. The sofas and chairs were deep and comfortable; a partner in luxury to the wines that are on offer at Darioush. 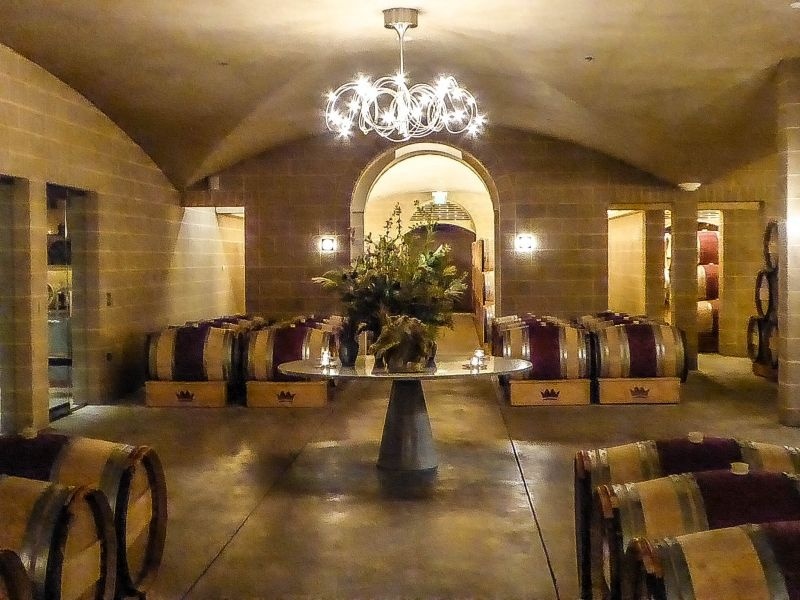 Below the tasting room are a set of rooms in the cellars that can be booked for private group tastings. The cellar corridors are narrow, too narrow for fork-lifts, so the movement of barrels is done by hand. Taken outside again, we were shown an amphitheatre, carved into a sloped. It provides seating for one-hundred and fifty people. The space is used for events featuring music, dance, and film. 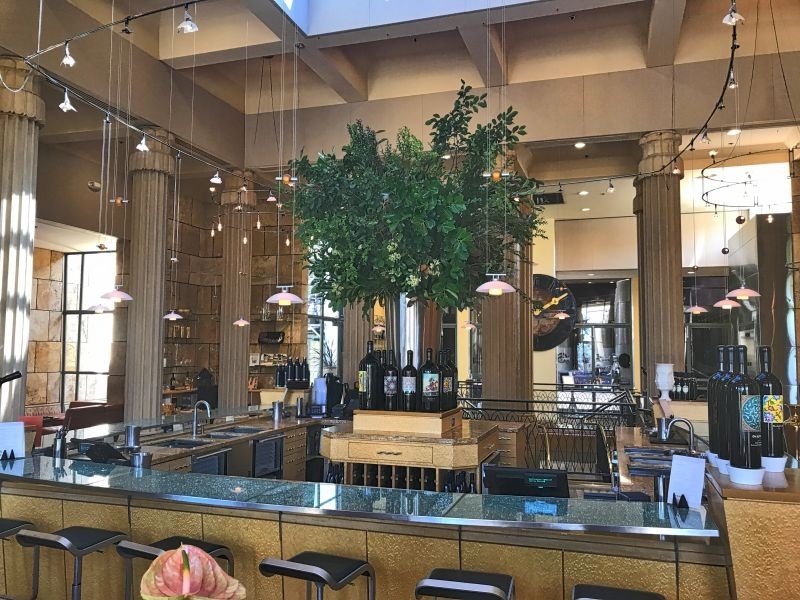 I enjoyed the wines at Darioush, but what impressed me most was the friendly and intimate experience of the tasting. The signature flight which we tasted costs $40. Appointments are required at weekends and recommended at other times.